It's a story I have wanted to do for a while... I love Facebook and social media, but there is something that has really bothered me. First off... last night was crazy. My heart goes out to those in Illinois and Indiana with the deadly tornadoes. Ohio had a few up near Toledo, but here in Central Ohio, we only had straight line wind damage. The damage in Pickaway County was rated at about 80 MPH due to the damage. Doesn't matter how you shake it, winds THAT strong will cause severe damage. Straight line winds are far more common in Ohio than tornadoes. As expected, the storms did weaken as they approached Central Ohio, but were still severe with many gusts between 65-70 MPH, and a few tornadoes near Toledo. So about being alerted to severe weather and social media... Facebook used to have the settings so you would see ALL of the recent Facebook posts. It was the "Most Recent" setting. Well, now as Facebook grows they have algorithms to only allow "Top Stories" in your News Feed. So some posts do not go to everyone's News Feed. For instance... Our ABC6 Facebook page has just over 100,000 followers. But the Tornado Warning for Franklin County last night was only viewed by 35,000 people. Not very good to rely on Facebook for life threatening weather. Twitter works well, but only if you are already on there checking the Twitter Feed. 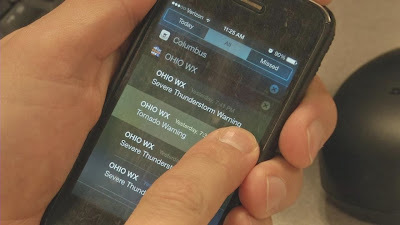 However, our Ohio WX app will automatically send notifications for the county that you are currently in at the warning time. So if you are away from home, you will be alerted for your new location. Other apps offer the same option. When it comes to life threatening weather on the way, it is very important to protect yourself and your belongings. The good news is that no dangerous weather is on the way. We will stay sunny and chilly for the next few days. Rain returns for late Thursday into Friday. By next weekend we are looking at MUCH colder air. Possibly staying below freezing heading into Sunday and Monday. Enjoy the sunshine and "cool" temps while they are here. Have a good one!